Why is Games Month so important this year? It’s Sit With Me’s 5th birthday and in rescue years, that’s a mighty big deal! And we want you to celebrate with us – and for us! Games Month started last year and will hopefully happen every year in the month of August. It involves friends, family, food, and lots of fun! But it also involves creating some awareness and raising some much needed funds for the rescue. You choose a game (or a few), you get some food together, and you invite family and friends over for a fun night and you ask them to make a donation for your hosting talent for the evening. You then donate the funds to the rescue and help save lives. You can host one, two, three or more games nights! Having Fun translates into Saving lives. It is perfect! And the best news of all? You can do this from anywhere in the world! Well, because these cute and adorable faces have no one else to rely on, and that means we need you! Plus, do you really need a better reason to pump up the fun level in your home? It encourages you to get social, try some fun snack recipes, pull out your favourite game, and start spreading smiles and laughter. We don’t know about you, but rescue has been a bit rough for us this year, and we need more reasons to smile. On top of that, we have some handmade and awesome prizes to share with you if you reach certain goal markers! You can create your own fundraising page on CanadaHelps at www.canadahelps.org/en/charities/sit-with-me-rescue/GamesMonth2017. You can sign up as a team or as an individual – if you create a team, you can still win a prize but only one to share for your whole team. You can choose to use this page and request online donations through it or you can just use the page to share why you have decided to join and raise funds for Sit With Me. Maybe you have a story of your own to tell about your dog or a dog that meant the world to you. This would be the place to tell that story. 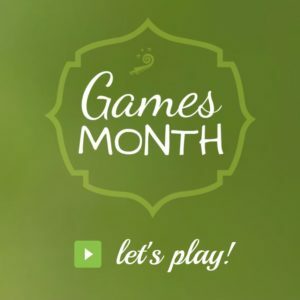 Then, join us on our Games Month facebook page to keep up-to-date, share your ideas and connect with our Games Month participants! Check it out at www.facebook.com/SWM.Games. If you email us at communications@sitwithme.ca, we will email you a profile or 2 of one of the Sit With Me dogs to share with your friends. You can choose to print off one of the stories or share the general info on the work we do. Hey, we want to raise fun and funds, but some awareness help never hurt! If you decide to collect funds at the party, you can always send the funds in later through your CanadaHelps page or through email transfer or paypal to sitwithmerescue@gmail.com. For each tier you reach, that prize is given to you, so you just keep on collecting! $500 raised –> $25 Certificate for a Crazy Beautiful product and a $25 “play money” to use toward our 2017 Fall Auction! Most long distant participant –> a Crazy Beautiful “Canada” collar – your choice of size and width (from 3/4″, 1″ and 1/5″). Most funds raised –> Crazy Beautiful Collar and Crazy Beautiful Crate Pad (from a selection to choose from). Get planning, and host one, two, three or more games nights and celebrate 5 years of life-saving work with us! Join us now on CanadaHelps to get started. If you have any questions, email us at communications@sitwithme.ca and we will help you as much as we can!